Tip: Click on the red Praia da Luz text above to hide this side menu or the blue Praia da Luz text to show this side menu. Choice: Resize the main text using these buttons. Tip: Widescreen users can change the browser size to suit this website. Tip: For a bit about this site, click on the icon at the top right of the page. Tip: For these tips in more detail click on the icon at the top right of any page. ( "Beach of Light" ) Like most towns on the Algarve coast it was originally a fisherman's village. Even though today it has grown into a popular seaside resort it still manages to retain a lot of its old world charm and at the same time offering the holidaymaker golden sands, superb dining and first class facilities. The bay is protected to the East by the famous Rocha Negra ( "black rock" ) cliff, a product of the Monchique region's volcano lava flow from some 150 million years ago. To the West is the old 16th century fort built to ward off pirates but now is a smart restaurant which has some spectacular views from its terraces. 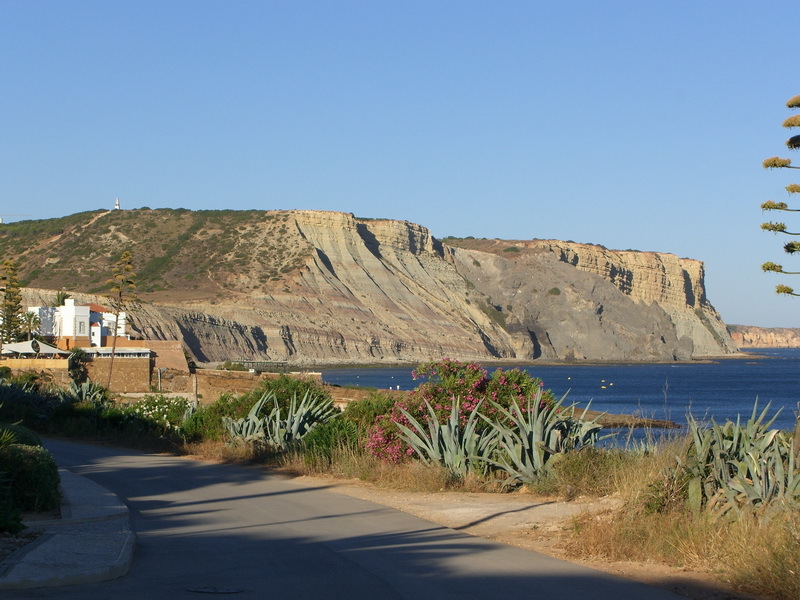 Between the two landmarks is Luz's lovely, long sandy beach which is overlooked by the town itself. An exceptional patterned cobbled promenade ( Avenida dos Pescadores ) runs from just below the pretty Church of Nossa Senhora da Luz ( Our Lady of the Light ) along the whole of the seafront to the cluster of beach bars. The promenade is normally busy with many craft stalls during high season and there are also several cafe / bars, restaurants and gift shops. Normally the holiday resorts on the Algarve pretty much close up at the end of the summer season but as Praia da Luz has quite a large population of resident English people, several of its restaurants and bars tend to stay open all the year round, though you will find their opening hours are much reduced ( generally from the begining of October through to about the end of March ). Update 2014 As a result of the continuing recession in Portugal a lot of places are remaining open later in 2014 ( as they did in 2013 ) and will be continuing to open earlier for the 2015 season. A stay over the winter period in Luz is quite popular and the Christmas and New Year festivities are normally well catered for. Remember that wintertime on the Algarve doesn't get particularly cold ( other than at night ) it just tends to rain a little bit more. 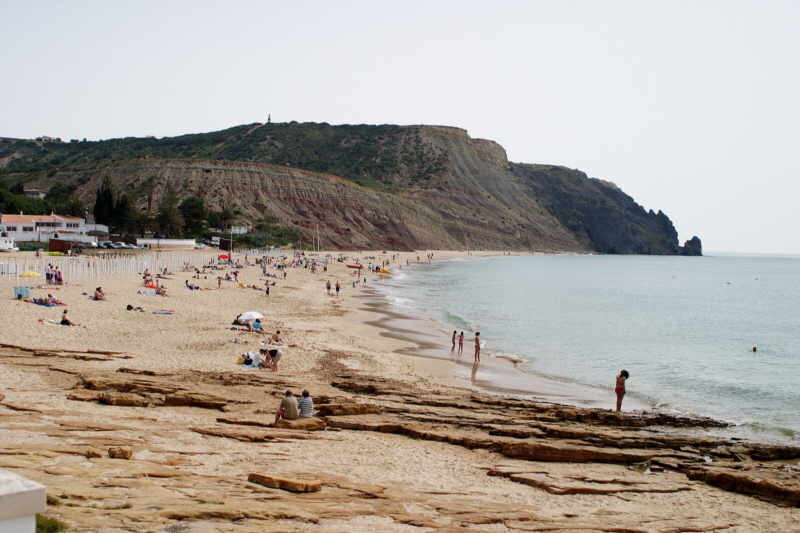 Even if your holiday is not based in Praia da Luz, a day trip to visit is certainly worthwhile and I am sure it will convince you to return for a longer stay. 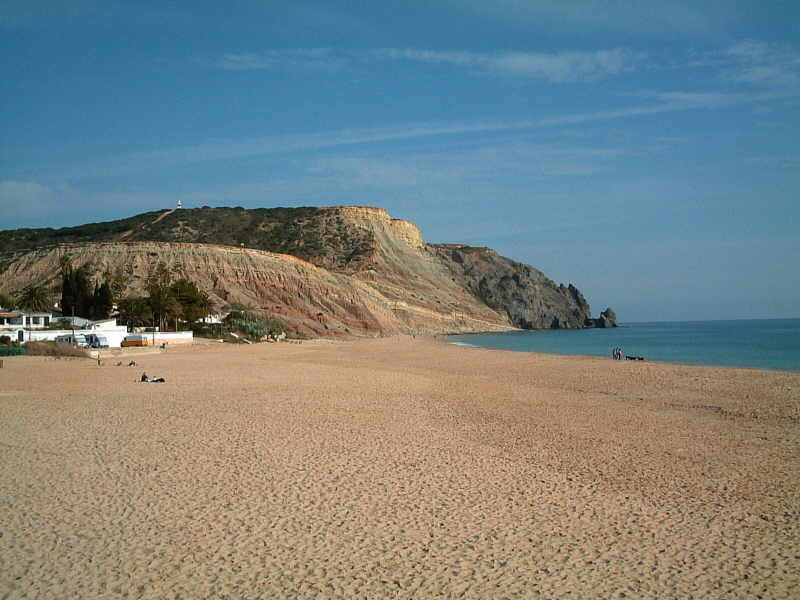 Praia da Luz's major highlight of course is it's wonderful beach. The gentle sloping sand and its shallow waters are ideal for children, and it is safe with lifeguards on duty throughout the summer months ( having attained the Blue Flag standard since 2005 ). Be careful though as those warm sea breezes are masking the fact that you are being subtly being incinerated by what can be a ferocious sun. You will find there are good water sports facilities in Praia da Luz, such as scuba diving, snorkelling, waterskiing, windsurfing, a sailing school, paddleboats, boat trips and from 2011 Luz has its own Bowling club. Sightseeing, especially if you have your own transport, is recommended especially if you head westward toward Sagres ( 'the end of the world' ) and the west coast generally provides some spectacular scenery. There are also plenty of day coach excursions to be had from the numerous travel agents. Algarve golfing is legendary and there are several well known championship standard golf courses close by which makes Praia da Luz an ideal base for golfers 'on tour'. Both Boavista and Palmares courses are within a ten minute drive and are perfect examples of the high standards to be found at all of the courses. Accommodation is well catered for with plenty of private and commercial villas and apartments for rent as well as several large holiday complexes which have been skilfully integrated into the town itself. Also there is no shortage of Estate Agents and Property Management services if you're totally smitten by the town of Luz. Praia da Luz and the Algarve, in fact Portugal in general has a history of occupation, from the Carthaginians and the Romans. Luz has its own Roman ruins ( fish salting vats ) fairly recently excavated and preserved, look for the small entrance in the wall of the promenade ( by the entrances to the O'Poco restaurant and Carlos Bar ). Then came the Moors, followed by the Crusaders in the 13th century, a brief spell of Portuguese kings, then conquered by Spain and eventually being reclaimed by the Portuguese. The fort was later built during the 16th Century, as were the many others to be found on the Algarve coast, to defend against pirates. The town is fairly compact and most everywhere is is a short walk, but will entail more often than not negotiating some 'hilly' bits that are not too bad but worth bearing in mind especially if accompanied by the elderly or young children. There a basically four main roads in Praia da Luz, the Rua 1 de Maio ( also known as the Rua de Espiche ) running north to south from the E.N.125 Sagres / Lagos road to main 'square' and the church, ( which is effectively the town centre ). The Rua de 25 Abril running West from the church up the fairly steep hill to the newer villa developments and also the road to Burgau. Then there is the Rua Direita running East from the church ( the main street ) which is the 'old' road out of the town joining the same EN 125 but nearer to Lagos. The Av. dos Pescadores runs south from the square past the church and the fort for a short distance and leads into the fairly new promenade running from just below the church, along the sea front to the main beach area. The extensive villa and apartment developments to the west of the town at the top of the hill on the Rua 25 de Avril, are completed and further building has taken a break, I assume due to economic reasons. as of the end of 2007 were sufficiently completed to not be that much of an eyesore anymore. 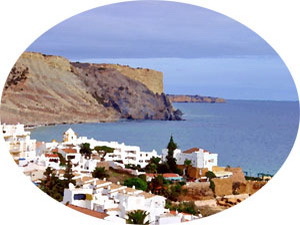 Just a brief description of some of the towns and villages closest to Praia da Luz. More details of facilities, bars and restaurants can be found on the Towns ( A - L ) or ( M - Z ) pages. 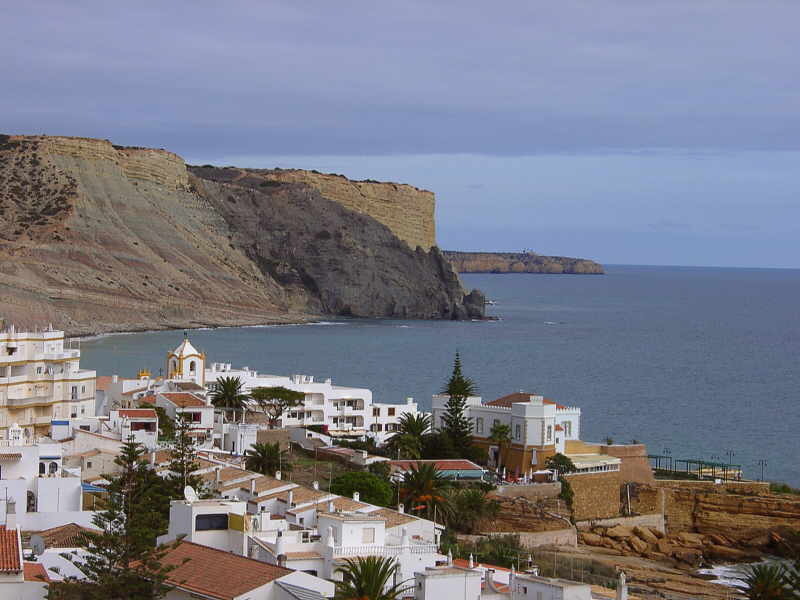 a large historic town is just 10 minutes east of Praia da Luz. It has plenty of shopping, a pretty good night life, and a large established marina. It is definitely the place to go if you want a change from the relative peace and quiet of Luz. Try the bus service from the town square in Luz for a quick and cheap trip, but it will be a taxi home if you are out for the night, as the buses finish quite early. 10 minutes drive west of Praia da Luz, is another old fishing village, overlooking a small bay and sandy beach, with a good beach bar. Relatively unspoilt by tourism ( protected by a conservation order to retain its character ). It has some good restaurants and bars. Built on a hillside, Burgau's old fishermen's houses line steep cobbled streets leading to the bay and the still active fishing fleet. a village on the main N125, with roads that lead south to Praia da Luz, and north to Barão de São João. A typical Portuguese village. The part facing the main road looks fairly modern and the roads are well made but go one row of houses back and the roads revert to old cobble style and are murderously narrow in parts. If you go into the village, rather than just by-passing it on the main road, you will find a couple of nice restaurants and bars, a supermarket and a couple of newsagents. Boca do Rio, Meia Praia, Praia da Almâdena, Praia da Batata, Praia do Burgau, Praia do Canavial, Praia da Dona Ana, Praia da Figueira, Praia de Porto de Mós, Praia da Salema. See the Beaches page for details. There are two major nature reserves, one covering most of the West. 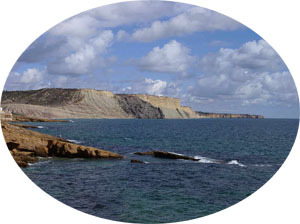 The Parque Natural da Ria Formosa, extending from Faro to the Guadiana and Spanish border, and the Parque Natural do Sudoeste Alentejano e da Costa Vicentina, which begins in the corner of the Alentejo above the Algarve, but extends down its Atlantic coast and turns around the Cabo de São Vicente to Sagres then runs back east towards Lagos, some 150km in total. Whilst building is not prohibited in these areas it is pretty strictly controlled and to a large extent, has managed to preserve a lot of the Algarve's unique character. - January 2013 The ambitious, but welcomed major project of works programmed during 2007 / 2008 was pretty much completed. It was scheduled in two phases, Phase 1 - February 15th to July 15th ( 2007 ) completed pretty much on time. It has resulted in a considerable improvement to the centre of town. Phase 2 commenced September 15th ( 2007 ) and as of August 2008 pretty much completed. The project encompassed major road improvements and extensions to the one way system ( done ). Also, improved tourist facilities such as wider pavements ( done ) and additional green spaces, namely the area of waste ground by the church ( yet to be done, but was rumoured to be started during 2011. However, this failed to materialise in 2011 / 2012, mainly for economic reasons. Renovation and Water system improvements were also also included. It did have some impact on tourism during the summer months of 2007 as various roads were closed, dug up, re-routed ( they are all completed ). Pavements have been replaced and widened. There was also the inevitable dust element whilst the works were in progress. Fortunately there was a break between phases for the peak of the tourist season. Whilst the works were a necessary 'evil' they have only made Praia da Luz, The Algarve, Portugal even more enjoyable for both the residents and visitors alike. Update 2012. Most everything building wise has ( understandingly ) been put on hold over the last 12 months and unlikely to change in the near future. Take some time to browse through the pages of this Praia da Luz holiday guide, and get an idea of the treat you have in store.